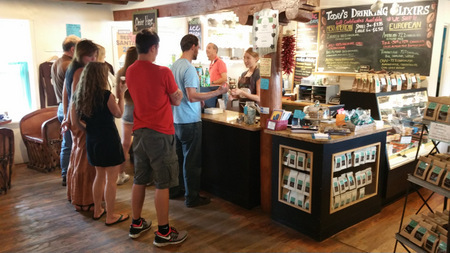 We do some chocolate tasting on our Santa Fe Culinary Tour and one of our favorite stops is the Kakawa Chocolate House, best-known for its chocolate elixirs. We thought it would be interesting to get a little bit of background about this delectable business from Bonnie Bennett, who co-owns it with her husband, Tony. Q. 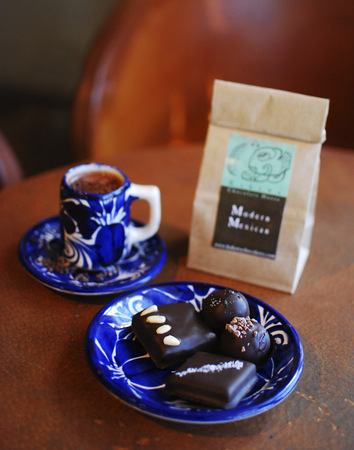 Drinking chocolate or elixir is your house specialty. Can you tell us a little bit about the history of drinking chocolate? A. It’s a looong history but here’s a quick version! Q. Why did you choose to make drinking chocolate your main focus? A. Kakawa Chocolate House was founded on the concept of re-introducing guests to chocolate! With extensive research of the role and recipes of cacao (chocolate) in the Mayan and Aztec cultures as well as in old Europe and colonial America, this remains a fascination and focus of Kakawa. Over the years we have used this research as a platform to create new and special contemporary elixir blends as well as amazing handmade truffles, caramels, baked goods and even organic ice creams! Q. What is your favorite drinking elixir? Why? A. With 16 to choose from I have several favorites! My single top pick? That has to be the Mayan Full Spice. In addition to being historically based on recipes from (literally) thousands of years ago it is amazingly complex with layers and layers of flavors created by herbs, florals, spices, nuts and, of course, chili. Q. What is the most popular item you sell? A. Our elixirs as a category are the most popular reason to come to Kakawa Chocolate House but our single most popular item is our amazing sea salt caramel. It is unlike any other you may have tried. Dreamy and delicious! Q. I know your caramels are made with agave rather than sugar. What other local flavors will we find in your chocolates? A. We are big believers in local and seasonal, and never use preservatives or corn syrups. Depending on the season, you may find a variety of local ingredients including mint, lavender, pinon nuts, apricots and of course, many varietals of New Mexican chilies! Other regional ingredients include prickly pear, mescal and other herbs. Q. How did you get into the chocolate business? How long have you been in the business? A. After leaving New York’s fashion industry we were intrigued by the concept and research that founded Kakawa Chocolate House and wanted to find a way to perpetuate these ideas and share some chocolate love! My husband and I have owned and run Kakawa for over six years. You can find one of us there every day! Q. Do you eat chocolate every day? A. Absolutely! I find a meal isn’t complete without a bite of good dark chocolate. There is the happiness (serotonin) factor of course, but also extensive medical research detailing how healthful good quality dark chocolate is for our bodies, hearts and minds! So, what’s not to love! Q. What are your favorite chocolate flavor combinations? A. Too many to name! 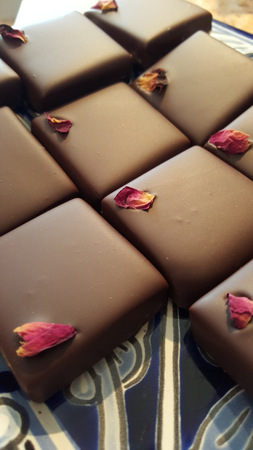 Our chocolatiers are always creating new and unusual combinations to delight the palette, so I am never without a “new” favorite! Some of my classic favorites include Blueberry and Basil, and Cherry Chili. Really anything with chili and dark chocolate; those Mayans knew what they were doing thousands of years ago!